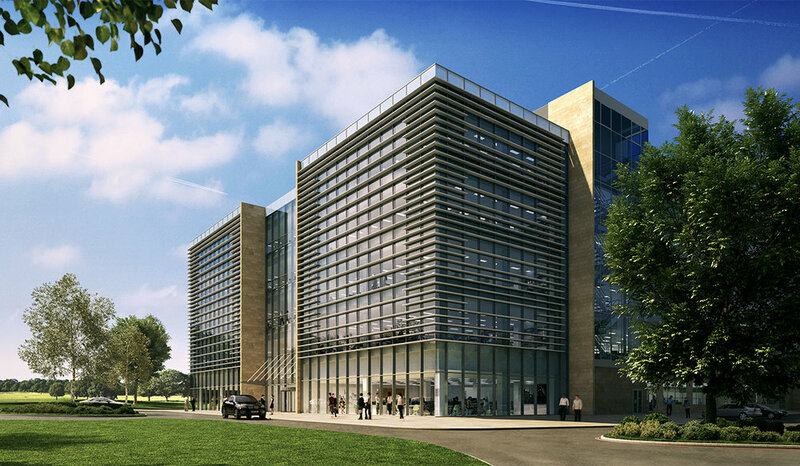 Sheffield-based construction company, J F Finnegan has been appointed by Bruntwood on behalf of The Royal London Mutual Insurance Society Limited to undertake the refurbishment and extension of the Parklands building at Alderley Park, Cheshire, which was acquired by Bruntwood in 2014. Parklands is a 140,000 sq ft building sitting across five floors. Originally built in 2002, this BCO award-winning building offers high-quality open-plan office space, a central atrium and ground floor cafe-style area. The redevelopment of Parklands will include a circa 38,000 sq ft extension spanning the southern façade of the building across all floors, a new link bridge, modifications to the central accommodation stairs, and strip out and replacement of all existing office fit-out and associated services. Dawa Singh, Head of Pre-Construction at J F Finnegan, commented “We are really pleased that Bruntwood selected J F Finnegan as their delivery partner for this scheme, in partnership with Royal London. We also know that Bruntwood is passionate about creating the right places for businesses to succeed and are committed to investing in award winning, quality developments. We echo these values and look forward to delivering this project." Peter Crowther, Director, Alderley Park, commented “This is an important next step in the relocation of Royal London to Alderley Park and we are very much looking forward to welcoming the team into the Alderley Park community”.